With this product you can accumulate up to 4 Glitter Points. Gives a feeling of freshness and comfort. 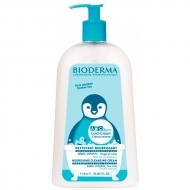 DESCRIPTION: ABCDerm H2O Lingettes Nettoyantes from Bioderma are cleaning wipes, with micellar water, for the delicate skin of the baby and the child. It is the first micellar dermatological solution perfectly compatible with the skin: its esters of fatty acids, constituent elements of the micelles, are similar to the phosphólipidos of the cell membranes helping to reconstruct the hydrolipidic film of the skin. Efficiently cleans in one step giving a feeling of freshness and comfort. They were soaked in micellar water in an ideal amount and did not dry out during use. Repeat until no longer needed, you can use both sides.